Check out today's pricing and retail availability for Atalayas . 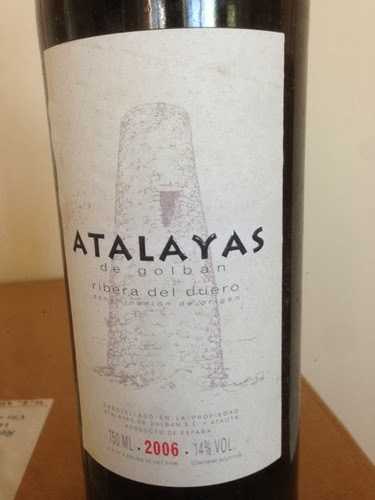 Original tasting and review : This is Atalayas De Golbán Ribera del Duero, Spain, 2006, finished at 14% alcohol. In the glass: Deep ruby/magenta, opaque in the center. On the nose: Poured at room temperature and swirled vigorously, shows full, flush and deep lush aromatic fruit. From the aroma, seems like this will be big, bold, sweet and pleasant. On the palate: The primary elements on the palate are in fact layered red fruits, showing soft red currants, soft oak, fresh toasty blackberry. The finish is a combination of lingering oaky fruit, plus a nice acid lift. Awesome balance. Holds its seven years of age very nicely. Perfectly poised for drinking now. In summary: Overall, rates three stars on the five-star Spirit of Wine scale, with an easy plus for awesome balance and longevity. Good value on the Spirit of Wine criteria.